Mandoliniste Country US né Kenneth C. Burns le 10 Mars 1920 à Conasauga (Tennessee). Jethro Burns est décédé le 4 Février 1989. Il a fait partie du duo Homer & Jethro. As the mandolinist in the classic country comedy duo Homer & Jethro, Kenneth Burns was one of the finest instrumentalists of his generation, yet many people never realized that fact. Behind the country hayseed garb, the hick patter, and the outrageous parodies of popular songs, "Jethro" Burns and guitarist Henry "Homer" Haynes were expert jazz musicians whose exaggerated hillbilly appearance and zany sendups of songs belied the cleverness of their comedy and the extraordinarily high quality of their music. From the duo's formation in 1936 to Haynes' death in 1971, Homer & Jethro were immensely popular, selling many records and becoming a fixture at the Grand Ole Opry. After Haynes' death, Burns began a solo career that abandoned comedy in favor of jazzy bluegrass and country. Jethro's music was extremely melodic and graceful, combining elements of jazz, swing, country, folk, and bluegrass, resulting in one of the most distinctive and influential mandolin styles in country music history. Born in Conasauga, TN, but raised in Knoxville, Jethro Burns (b. Kenneth C. Burns, March 10, 1920; d. February 4, 1989) began playing mandolin when he was a child, picking up his brother Aytchie's instrument. By the age of 11, he had grown into a skilled and accomplished instrumentalist, and he and his brothers frequently entered talent contests across Tennessee. At one of the concerts they lost, the sponsoring station, WNOX, asked the brothers to join a band called the String Dusters with another losing contestant, Henry Haynes. They accepted, and the group quickly earned a following; even at this stage, Jethro's playing demonstrated jazzy influences and inflections. By 1936, Aytchie had left the group and Burns and Haynes had created the comedic Homer & Jethro characters that brought them to popularity. The duo made a good living from these rubes, winning a Grammy in 1959, starring in Las Vegas, and appearing regularly on TV, including The Tonight Show. Although they canned the country corn occasionally (as on Playing It Straight, a 1962 album), their on-stage wit and parodies of well-known songs ranging from the opera to the Opry made them famous. Regarding his "Jambalaya" being turned into "Jam Bowl Liar," Hank Williams said you know a song's good when it's been given the Homer & Jethro treatment. Other zingers include "She Was Bitten on the Udder by an Adder," "Mama, Get the Hammer (There's a Fly on Papa's Head)," and "I've Got Tears in My Ears from Lying on My Back in Bed While I Cry Over You." Following Haynes' death in 1971, Burns continued to perform and teach the mandolin. During that decade, he wrote two instructional books on how to play the instrument with Ken Edison, which were published by Mel Bay. During the late '70s, Jethro played with the folksinger Steve Goodman, as well as the great country guitarist Chet Atkins. He also began recording a series of jazz albums during that era, many of which featured his son John on guitar. 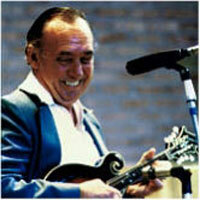 Jethro Burns continued to perform at string music festivals and concerts until his death in 1989. In the series of swing jazz albums he released during the last decade of his career, Burns demonstrated why he was considered the best mandolin player of a generation and, in the opinion of many, the best who has ever lived.